He found the job posting on accident. But it led to a 40-year career in real estate, law and education — an “extremely rewarding” and life-changing experience, according to Roy Black. "(Real estate) is always changing, it's extremely dynamic, which presents a new set of challenges." In more than two decades working with students, Black has no doubt impacted countless lives at Goizueta Business School. His unique perspective extends well into the real estate industry and Atlanta. It’s rewarding for many reasons but, according to Black, most notably for its tangible nature. 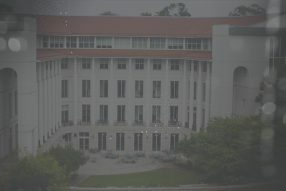 Black joined the Goizueta faculty as a part-time instructor in 1997. He joined the full-time faculty in 2007 and now, in the middle of his 20th year, continues his work as director of the Real Estate Program. This came, of course, after a career as a real estate attorney perched on the front lines of some of Atlanta’s biggest booms. He’s seen the industry become more attractive to institutional investors and eager developers. His knowledge and experience make their way directly to the classroom. His network comes to the aid of countless students looking for jobs. Things are looking up for the real estate market in Metro Atlanta, of which Black is considered one of the premier experts. In 2017 he spoke at length about growth in the region with The Atlanta Business Chronicle. Click here for more. The accidental job discovery came in Black’s law school days. It was the early 1970s. The law firm needed someone to examine titles. It seems boring, but Black fell in love. He quickly learned, despite the permanence of buildings, real estate to be an ever-changing environment with ample room for problem solving. With 15 years’ experience as a real estate attorney, Black has plenty to offer his students. “If you’re dealing with money, or you’re dealing with soap products or automobiles, you can move those around,” he said. “But you have all these inherent limitations of real estate and the fact that it doesn’t move, it’s a tremendous challenge. "Between Professor Black’s leadership and experience, the analysis of student participation and the performance of the sector as a whole...I think that has been a recipe (for success)." With student input, Black kicked off a real estate investment fund that allows students to manage a portion of the university endowment. For his students, Black is eager to share the appeal that comes from real estate not being a monolithic job description. There are at least 20 different job descriptions with a range of risk levels, from development to property management, and apartments to industrial or office space. To gain experience students at Goizueta run a real estate private equity fund, which Black formed and maintains after student interest. The fund has two goals: provide students — about 25 each semester — an educational experience of managing real money, and ultimately act as an endowment fund for the real estate program. The students meet six times each semester, and after they’re divided into teams, they each present results of analysis before an investment decision is made. The fun began in 2012 with $25,000. After donations and returns from real estate deals, there’s now $230,000 under management. Preston Stevens is an MBA involved in the program with a background in commercial real estate. It was naturally appealing for Stevens to help the fund invest in that space. Know someone who exemplifies Goizueta's principled approach to business? Let us know. Investing in Goizueta is the best way to ensure our school continues to excel in business education. ©2019 Goizueta Beyond . All Rights Reserved.